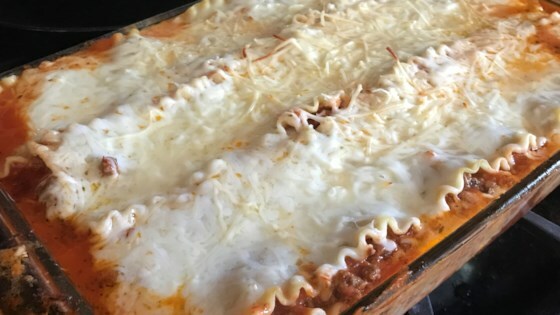 "My family loves lasagna, but sometimes I lack the time for the long version. This is easy and satisfies everyone. Try it tonight!" It's quick to fix but the flavor was not the best. I thoroughly enjoyed this recipe, but I recommend adding about 50% more spaghetti sauce, because otherwise, it's a little dry. With that suggestion, it is the perfect lasagna! This lasagna was great! I was looking for an easy lasagna recipe and I've found it. I did use more spaghetti sauce than the recipe called for.